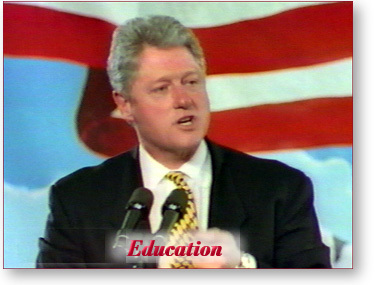 Below you will find a brief presentation about the Clinton Administration and education using the latest version of Shockwave to present dynamic photographs synchronized to streaming audio. Please note that we have taken every step to make this presentation accessible to as many people as possible. However, as it represents some of the latest technology on the Internet, performance may vary, depending on equipment, memory, connection speed and Internet traffic. If you experience difficulty playing the movie you might try increasing your memory and cache settings.